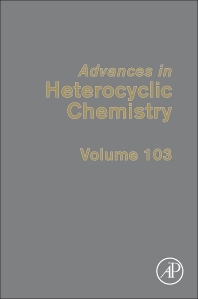 Advances in Heterocyclic Chemistry, Volume 103, deals with the organic chemistry of heterocyclic compounds, namely, photochromic dihetarylethenes, pyrido[1,2-a]azepines and their hydro derivatives, and 2-amino-4H-pyrans. Divided into three chapters, the book examines advances in the synthesis of these three compounds, including dithienylethenes that are derived from photochemically induced isomerizations between the cis- and trans-forms and cyclized derivatives. The book first looks at the synthesis of photochromic dihetarylethenes, such as perfluorocyclopentene-bridged dihetarylethenes, along with dithienylperhydrocyclopentenes and their heteroanalogs, like perhydrocyclopentenes, dithienylmaleic anhydrides, and dithienylmaleimides. It then discusses the McMurry reaction and the reactions between octafluorocyclopentene and lithium derivatives of thiophene. It also examines chemistry, structure, reactivity, and the pharmaceutical and agrochemical uses of of pyrido[1,2-a]azepines and their hydro derivatives. The book concludes with a summary of the synthesis, structure, reactivity, and practical significance of 2-amino-4H-pyrans. This book will benefit graduate students and research workers in academic and industrial laboratories who want to gain a better understanding of heterocyclic chemistry.